June 15, 2011 started as a tragedy and ended as a farce. Parliament convened to debate the government’s proposed medium-term strategy, only to be confronted with protests and violence outside the parliament building. A series of intense discussions followed during which the prime minister offered to step down in favor of a government of national unity only to retract that offer in a televised address, blaming the opposition for leaking the information to the press. Instead the prime minister said he would sack his cabinet, form a new one and ask for a vote of confidence in parliament. Unless a miracle happens, this marks the end of this administration. PM George Papandreou is counting that the Greek public and political class will prefer his (imperfect) stewardship over the turmoil of elections. He also believes there is enough popular support for his policies that the people will stand by him. The problem is that he has tried this blackmail before and it is getting tiring. During the November 2010 local elections, he threatened national elections unless the electorate voted for him – he then took an ambivalent result, declared success and put the question to rest. He has also threatened from time to time to hold a referendum – only to backtrack later. Add to that that he offered to resign to the leader of the opposition without first consulting many in his own party – only to then take it back – and he is rapidly exhausting the patience of even his allies. 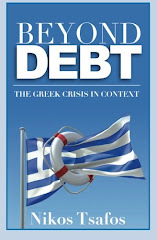 Mr. Papandreou faces three problems, and a reshuffle can only resolve one. First, his cabinet includes many unwilling parties, and over the past few months there have been quite a few open disagreements about policy among his ministers. Further, ministers often implement reforms begrudgingly or not at all, as they look to shelter their own power base. Second, he faces dissent in his party more broadly. Deputies openly said they would vote down his medium strategy, and he almost certainly lacked the majority to pass it. Third, he is less and less popular with the public: just 23% think he is most suitable as prime minister, down from 41% in January. The problems are, of course, linked to each other: lack of popular support makes politicians less willing to cooperate, which in turn causes public disconnect at the slow pace of change. Getting rid of a politician with little support in his cabinet, the parliament and the public should be good news. But this is not the whole story. For one, other politicians are barely more popular: the leader of the opposition, the most popular politician right now, gets a 35:58 positive:negative rating. Only 23% think of him as the most suitable to be prime minister. Public discontent runs deeper than disenchantment with the prime minister. Whether this government survives or not, whether the country heads to elections, which may or may not produce a working government, the choices facing the country do not change: Greece can either keep implementing the memorandum with the IMF, carrying out a massive shrinkage of the state sector through reduced spending and a host of privatizations, or it can renegotiate its debt in the hope that this will alleviate pressure from state finances and allow it to make reforms more gradually – or, more likely, restructure debt so as to keep on life support a political, economic and social system that has failed massively. There is no other way. Plus, external help is contingent on Greece showing political will, which it is currently not, so time could run out sooner rather than later. The broader issue, however, is that there is no politician that is yet able to stand up and articulate a coherent message of where this country needs to go and why. If I can paraphrase Aaron Sorkin in the American President, “the problem with Greek politicians isn’t that they do not get it. It’s that they can’t sell it.” If the government falls, as it may, what comes next? The choices the country confronts have not changed. The opposition’s mantra – to renegotiate the terms of the bail-out package with the IMF – can hardly be reconciled with a fiscal hole that needs filling and with the exhausted patience of the Europeans and the IMF. So the country is confronted with a path that is more or less clear but with no political steward to take it there. I agree with the entire analysis except for the last bit. A new cabinet or, more likely, a new government cannot change the policies that need to be implemented; it will face the same opposing argumentation. Moreover, MPs face likely non-reelection regardless of their party/ stance due to public anger. Greek politicians are definitely not selling whatever it is they are trying to sell. But they are also not appreciating their political costs in the process. They just don't get it. *[I am not talking about the State's economic/ financial costs, that's a different story].